You can use a text box to add a title or narration to the top of your Power Map, much like you would add a sticky note to a paper map. Click Home > Text box. 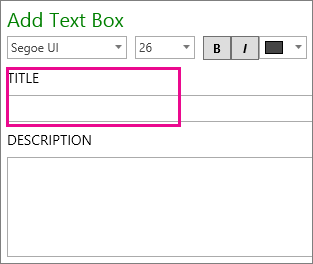 In the Title box, enter the title for your text box. In the Description box, add a note or narration. 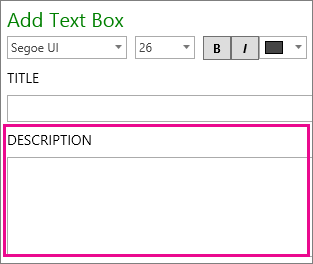 If you want, use the formatting options at the top of the box to change the look of your text. 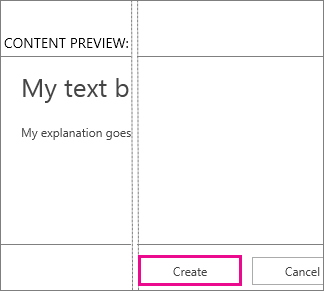 Tip: You can see a preview of your text box in the Content Preview box, located to the right of the Title and Description boxes. A text box keeps its position inside a scene when a tour is played. Unlike annotations, they’re not bound to a specific data point; instead they are anchored to the nearest quadrant or corner of the Power Map window. You can change the size of the text box and place them in different locations on the map to prevent them from covering your map data.